The words kept pulsating through my head in the days leading up to my dinner date at The Golden State last Thursday. During my first visit to the casual burger and beer mecca, I’d told co-owner Jason Bernstein that I was planning to return the following week for the famed lamb burger, a special on Thursday nights. At the mention of the prodigious burger, his face turned grim and serious, as though he was about to warn me about the dangers of Tweeting while driving. I was immediately shaken by his well-meaning advice. How early was “early?” I wondered. Did I need to run there straight from work? Call ahead of time to stake my lamb claim? Shove well-meaning patrons out of the way upon arrival so I could be first in line to order? So I convinced myself that it would be fine if the lamb burger was sold out by the time my two girl friends and I arrived at the restaurant at approximately 6:45 pm last Thursday. I prepared myself for disappointment – even had a different order ready to go. I practiced it in my head as I walked down Fairfax Avenue toward the humble storefront. “That’s a-ok, Jason. I’ll catch that lamb burger on the flip-side. Just put me down for the turkey burger with some of that sweet sauce Applewood bacon you got there.” I’d say. Fortunately, I didn’t need to abandon my personality to coin such terminology. When my friend and I went up to the counter to place our orders, Jason informed us that there were still at least 10 lamb burgers left. I exhaled for the first time in six days. At his recommendation, I opted for a heavier brew to pair with the burger, which comes with roasted red peppers, yogurt dill, gruyere, arugula, house-made curry ketchup, and a cucumber and feta-intensive Greek salad on the side ($14). The Mongo IPA ($6) was the proper selection – the assertive undertones of grapefruit were hearty enough to stand up to the aggressive flavor of the oregano-seasoned patty and all its fixings. Regardless of the internal temperature of the patty, the lamb burger at The Golden State is well worth the rush (and anxiety) to get to the counter. The high-quality ground lamb is heady with Greek flavors that are finely tuned by the accompaniments. The sweet peppers, tangy yogurt and curry ketchup, nutty glove of gruyere, and peppery arugula accentuate the savoriness of the meat rather than distract from it. Everything is in perfect collusion. I could scarcely bear to put the burger down to pay heed to the sides – the nicely executed Greek salad, and the oversized sweet potato wedges we ordered to share ($4). Despite my partiality to greens, the soft potato wedges and accompanying garlic aioli were more to my fancy on this particular evening. I badgered most of the neatly stacked “fries” while my dining companions were transfixed with their own burgers. It’s easy to be transfixed by everything at The Golden State – including the personalized service and personal touch that is injected into every corner of the familial room. Jason and the staff will tell you when the burger should be ordered medium-rare. They’ll tell you what beer they think will pair best with your selection. And they’ll tell you exactly how to score that picture perfect lamb burger. 1 traffic violation for texting/tweeting while driving. Consider this a public service announcement. You’re welcome. When my family was in New York spending Christmas with my older brother a few years ago, my brother pulled a bottle of Zinfandel called Seven Deadly Zins to start off one of our many wine-infused evenings. We all giggled at the funny label, certain that this was a joke – maybe a gift from a well-meaning assistant? We cracked open the bottle, each poured a tiny shot’s worth into our glasses, and braced ourselves for a poorly balanced, acidic wine. Instead, our tongues were enraptured with jammy fruits, spice and a well-rounded finish that seemed completely at odds with the bottle’s coy label. It was the first instance that I realized that wine doesn’t have to be rife with pretension and over indulgent sniffing and swirling (my father is an expert at the practice). Wine can be, and should be, fun. This concept is near and dear to the hearts of Morgan First and Tyler Balliet, the Co-founders of Second Glass, a small Boston-based company that is organizing a series of wine tasting events called Wine Riot at major cities across the United States. The whole premise behind the venture is to make wine events fun, informational and accessible for non-oenophiles, while still offering quality wines from appealing vendors. The point is to take away the intimidation factor without sacrificing good taste. This past Saturday, my friend Ashley and I were able to use press passes to experience all the Wine Riot hijinks first-hand at the Los Angeles event, which was held indoors on the third floor of the Santa Monica Place mall. Prior to our arrival at the venue at 1:30 pm, we both secretly thought that we would never last until the end of the afternoon session at 5 pm. Yet as we began making our way from table to table, engaging with the vendors and our fellow attendees, our stamina for sipping increased. We indulged in a highly unoriginal conversation with the Gaga wine representative about the origin of the Santa Rosa winery’s name, while tasting the surprisingly pleasant Rosé. We discovered (and photographed) a vendor who looked uncannily like our mutual friend’s husband. And we went back for free samples of the Buffalo Wing-flavored Pretzel Crisps four times. Amidst all the fun and mass consumption of Pretzel Crisps, we also discovered several relatively affordable wines that we gave “two thumbs up” to on the Second Glass mobile application I’d uploaded onto my phone prior to arrival. For whites, we enjoyed the dry 2009 Eroica Reisling from Chateau Ste. Michelle winery in Washington, the Vincent Raimbault 2008 Vouvray Doux from Loire Valley Wines, the Herdade do Esporão 2009 Esporão Reserva White from Portugal, and Fess Parker’s Fortress Sauvignon Blanc. For reds, we still found favor with that darn Seven Deadly Zins from Michael David Winery, as well as his 6th Sense Syrah and fuller bodied Lust Zinfandel. Other hits on our list included the Herdade do Esporão 2009 Monte Velho Red from Portugal, as well as the 2008 Alexander Valley Vineyards Temptation Zinfandel, and the Proof Wine Collective’s Denial Anti-Wine Red. As we snatched up one last round of Buffalo Wing Pretzel Chips for the road, it was clear to both of us that the team at Second Glass had accomplished their mission for the Los Angeles Wine Riot event. We had a ton of fun. And have the fake tattoos to prove it. The night that the earthquake and tsunami rocked Japan, I was eating dinner at Scarpetta. It was hard not to feel guilty when I arrived home, looked at my Twitter feed and saw that the country was being ravaged by an indestructible force of water. While I had been eating $24 spaghetti. Watching the devastation on CNN that night, I felt a mélange of feelings – horror, sadness, disbelief, and helplessness. It was strange seeing the disaster unfold on TV, a medium that I turn to for my dose of teen dramas and reality competition shows like “Top Chef.” In some ways I felt like I was watching a movie – like it wasn’t really real – particularly because when I turned it off to go to bed, it was no longer there in front of me. If I chose to, I could go on with my every day life and pretend that it hadn’t even happened. But when I woke up the next morning, it was still pulsating through my mind. I rushed again to the TV to see what was going on, and when I finally peeled myself away to leave for the office, I couldn’t help but feel strange that I was going to work like it was any ordinary day when for so many people it wasn’t. In the time since the tsunami, my initial sense of helpless has grown exponentially with each new problem that has cropped up as a result of the disaster. It doesn’t seem there is much that I – or anyone else in America – can do from all the way across the ocean aside from pray and/or donate funds to the relief effort. Yet for chefs – both professional and amateur – the first impulse in this type of situation is often a desire to get in the kitchen – to use that talent as a means of a grander contribution. Restaurants across Los Angeles have already gotten in the game. For the past week, Cube Cafe on La Brea has been hosting a “Red for Red” fundraiser donating 100% of proceeds from sales of three red wines by the glass to the American Red Cross’ disaster relief programs in Japan. The promotion ends tomorrow. Xino at Santa Monica Place offered special lunch and dinner specials last week with 10% of profits benefitting Give2Asia. And during this past weekend’s re-opening, Sushi Nozawa on Ventura donated every dollar spent between 5 – 10 pm to the Japan Relief Fund. This coming Saturday, April 2nd, the amateur kitchen mavens will be firing up their ovens in support of the cause. Food bloggers across America will be joining forces with professional chefs and their restaurant and bakery brethren to host bake sales for the relief effort. The nationwide fundraiser, called “Bake Sale for Japan,” was conceived by Samin Nosrat, Pop-Up General Store cofounder and Tartine Afterhours chef, in San Francisco. Previously, Samin raised $23,000 for quake relief in Haiti through three bake sales that took place in the Bay Area last year. For this upcoming fundraiser, Los Angeles, New York, Portland, Salt Lake City, Austin, Chicago, and Hawaii, as well as other cities across the country, are getting involved. Breanne Varela, the pastry chef at Tavern restaurant in Brentwood, is organizing the bake sales that will be taking place in Los Angeles, and has been reaching out to local food bloggers, and professional and amateur bakers and chefs for baked treats and other sweet contributions. A complete list of the national locations can be found on the “Bake Sale for Japan” website. All proceeds from these sales will be donated to Peace Winds Japan, a non-governmental organization that is currently contributing 100% of its donations to the relief efforts in Japan. I’ve already committed to baking my carrot cake oatmeal cookies for the BLD location in West Hollywood and hope that my fellow bloggers will consider donating to the cause as well. If you are interested in getting involved, please contact Breanne at LosAngelesBakesale@gmail.com for more details. If you don't feel up to baking, you can still help out by donating a non-food item, such as artwork or a gift certificate, or by volunteering to work a sale and help organize, collect and distribute the baked goods. Just email Breanne at, again, LosAngelesBakesale@gmail.com to discuss how you can contribute. While the road ahead is still unclear for the people of Japan, this is one clear way that we, as a community, can show our collective support and concern for their behalf. And perhaps that’s the most important thing that we can do at this juncture. Let them know that even though we are across the ocean, their plight is real to us. We care. Up until I dined at Scarpetta a couple weeks ago, I associated Chef Scott Conant’s big, bold Italian restaurant with one thing – $24 spaghetti. It was impossible not to equate the Beverly Hills restaurant (the fourth or fifth location) with that acclaimed slurry of, apparently, perfectly sauced noodles. All the food literature I’d read about Conant’s latest grandiose venture had mentioned it in vivid, lusty detail. LA Weekly’s Jonathan Gold claimed that “even in the dreary weeks of late autumn, when great tomatoes are as rare in the supermarket as fresh peaches, Conant's spaghetti is first-rate.” Brad A. Johnson of Angeleno Magazine referred to the “towering beehive of carbs” as “the very definition of ‘al dente.’” Blogger EstarLA “found [herself] scarfing down the European-sized portion of noodles and sauce” on her visit to the restaurant this past November. In my mind, Scarpetta was its $24 spaghetti. But then I went to the restaurant. I sat in one of the straight-back, clothed chairs – seemingly present for the explicit purpose of conveying that this is a place for formal, serious dining – and my friend and I ordered it, along with a few other dishes that were, well, not the spaghetti. When it arrived, coiled up in a tight knot of sauce and steam and basil, I twirled a dense, egg-y noodle around my fork. I took note of the satisfying chew of the pasta, the delicate balance of the tomato sauce – not too acidic, not too sweet, not too thickly applied. Just right. And then I looked across the table at my friend and shrugged my shoulders. Ultimately, the dish that most arrested me on our extravagant evening among the black-clad, aged industry set was the polenta with truffled mushrooms ($16) – one of our “not the spaghetti” plates. I couldn’t get over the sultry texture of the polenta, which, like the spaghetti, is another humble food item that Conant has elevated with his astute respect for the ingredients. It’s sweet like freshly churned French butter, smooth like a finely groomed potato puree, and soft and luxurious on the tongue – the cashmere blanket of foods. The mushrooms are no less compelling. 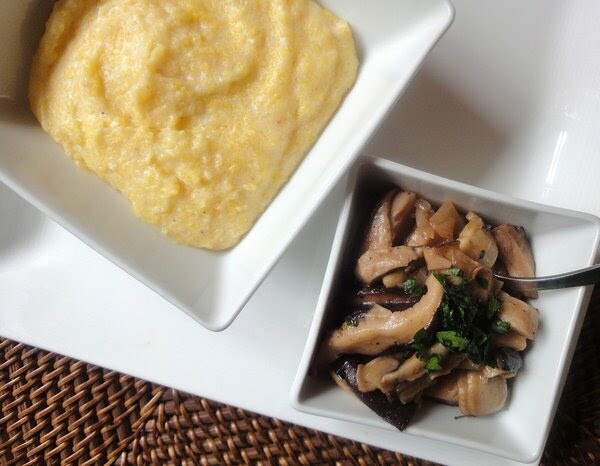 They’re the yin to the polenta’s yang – authoritative where their accompaniment is yielding. Bathed in truffle oil and a rich, fleshy chicken stock-based gravy, the mushrooms collapse into the polenta, announcing their presence like a bone-in rib-eye steak. It’s comfortable luxury – accessible luxury. Which is why it was the dish I felt compelled to recreate for TasteSpotting’s Eating Rainbow series rather than the more famed spaghetti. My version is, of course, nothing like Conant’s. Some might even say it’s the healthy yin to his decadent yang. But I think it’s just plain good. I was a little overconfident going into Lent this year. I really thought that I’d be fine for this go-around. I’d voluntarily given up desserts for two weeks in September and then purged them again for another week in early February. It hadn’t been particularly hard on either occasion – seemingly because I’d already primed the pump for sugar deprivation during my first dessert-free Lent last year. The first few days of Lent were actually okay this time – I wasn’t having headaches like last February, and was feeling half-way normal (ie. not having dreams about gorging on frosting). But after the first week had passed, things started to get a little more hairy. At a media dinner at LA Market last Tuesday, I had to stand away from the table while my dining companions attacked a giant dessert platter of sno-balls, cotton candy, caramel popcorn, chocolate chip cookies, brownies, and rice krispies treats made of fruit loops. It was equally hard this past Monday when I finished lunch and realized that, yet again, I wasn’t able to “cleanse my palate” with dark chocolate. While I’ve been trying to get through Lent this year without resorting to any of the pinch-hitters I relied on last year – flavored Greek yogurt loaded with dried cranberries and frozen blueberries, super sweet dates that taste like caramel, etc. – my tongue started to get a little itchy over the weekend. First I latched on to some unsweetened dried peaches from a stand at the Farmer’s Market at Third and Fairfax, and then, on a whim, I threw a bag of Trader Joe’s Just Mango Slices into my grocery basket on Saturday. I hadn’t expected much from the thin, jerky-like slabs of unsweetened, dehydrated mango. They looked a bit sad all clumped together in the clear packaging – hardly even worth the effort to extract a couple pieces from the mango mass. But when I sat down to watch last night’s “Top Chef” with them, armed, as usual, with a cup of peach rooibos tea, I was arrested by their chewy texture and subtly sweet mango flavor. “It’s like a fruit roll-up that’s actually made of fruit!” I thought with giddy pleasure as I reached for a second piece. While Trader Joe’s Just Mango Slices is not an item I’m planning to gorge on during those dark moments of sugar-crazed weakness (4 thin pieces contains 120 calories), I think I’ve found my new best friend for the next 31 days. When I ate my first cheeseburger last February, I thought it would be sort of a one time thing. Even though I grew up eating In-N-Out burgers after cross-country practice, prior to the grand event, I had convinced myself that I just wasn’t a burger kind of girl – that I didn’t have that innate lust for bloody meat coated with drippy cheese. “I like vegetables,” I told myself rather snottily and was actually slightly dreading the experience of ingesting a half pound of ground up cow flesh during the week leading up to my dinner date at Rustic Canyon. I wasn’t expecting to fall head over flats (I’m a tall girl – can’t wear the heels) with that first blissful cheeseburger. And I certainly wasn’t expecting that I would continue craving them on a regular basis. Despite my love for roughage and compulsive ingestion of all things containing fiber, in my mind, there are few things more satisfying than a cheeseburger with all the fixings. I love the way it feels in my hands – substantial, solid – something that I can really sink my teeth into. I love that it comes fully intact with everything needed for a “complete” meal – meat, bread, a marginal amount of fresh vegetables courtesy of a few leaves of lettuce, a sticky mass of caramelized onions, or a smattering of sweet bread and butter pickles (my favorite). And I love that when I finish a burger (and I always finish them), I feel gorgeously full. It’s been sort of a challenge for me to feel completely full lately. Because I gave up desserts for Lent, even after I plow through a trough of roasted cauliflower, chickpeas and quinoa, I still feel like I’m not ready to be done eating yet. I want something more. I want something sweet and fatty and delicious. And the cup of rooibos peach tea is just not cutting it. This past Friday was particularly rough. I was feeling tired from the time change and cranky from my inability to touch any of the chocolate that is hibernating in my snack drawer at work. I knew that I needed something really hearty for dinner that night – something containing meat. I was meeting a friend at the Farmer’s Market at Third and Fairfax that evening, but as I was driving over, all I could think about was how much I wanted – nay needed – a burger. By the time I had arrived, I was convinced that nothing else would do. I anxiously waited for my friend, praying that she would be game to walk the three blocks down Fairfax Avenue to The Golden State, a bare-bones, counter service eatery that’s well-known for their classic burgers, artisanal beers and commitment to showcasing the best that California has to offer in terms of food and drink. “They have fish sticks on Friday and Saturday nights,” I told my friend, flubbing my words in my rush to convey how necessary it was that we go there. “Fish sticks?” She asked, looking at me like I was crazy. “Fish and chips!” I exploded, the words finally coming to me. “It’s a special! And they serve Scoops ice cream!” I continued, hoping to lure her in with the promise of some brown bread ice cream. I was practically giddy on the walk over – already fantasizing about that glorious first bite – the juices that would dribble down my chin, the housemade aioli that would streak across my bottom lip until I licked it off. The restaurant was already busy when we arrived a little after 6 pm – most of the tables lining both sides of the one-room space were occupied with couples grabbing a quick post-work bite. Without hesitation (for once, I was not terrified by a restaurant menu), I decisively placed my order for the burger made with Harris Ranch beef that comes topped with Fiscalini Farms cheddar, glazed Applewood smoked bacon, arugula, housemade aioli and ketchup ($10). I selected the jalapeño cabbage slaw as my side (sweet potatoes fries, French fries, potato salad, and Persian cucumber salad are also available) and, in a wildly uncharacteristic move, tacked on the Craftsman 1903 lager on tap to drink. The light, refreshing beer was the perfect partner for my burger and slaw. While I usually pinch up my nose when offered a beer, claiming that it’s “too heavy,” the malty brew tasted just right that night. The burger, as expected, tasted just right, as well. Though the texture of The Golden State’s patty is a little more loosely packed than I usually prefer, all the elements are astutely composed. The cheese is lacquered onto the burger with the perfect melt, the ketchup and aioli add an assertive tang, the glossy brioche bun appears as if it were specifically made to house the medium-rare patty, and the sweet slabs of smoked bacon enhance rather than detract from the flavor of the beef. I inhaled everything. The beer, the burger and the heap of sesame-oil scented jalapeño cabbage slaw that is milder than the title would suggest. As I stared down at my empty plate and empty glass, it struck me that just a little over a year ago I would have laughed if someone had told me that I would one day crave a tall glass of beer and a bacon-topped, drippy cheeseburger. “I’m just not a burger and beer kind of girl,” I would have said with a casual shrug. I couldn’t be happier that I finally, blissfully, saw the light. And at The Golden State, that light looks pretty darn good. I know it seems strange – particularly since I regularly go on the Mozza website to read theirs for fun – but when I’m at a restaurant, sitting at a table, with a menu in my hand, I’m so nervous I can barely hold it up straight. It doesn’t get any better when the server arrives to take my order. I’ll usually look up at him or her with distressed eyes, pleading with them to make the decision for me. “What’s your favorite thing?” I’ll ask, hoping that they’ll throw me a lifesaver that’ll help me finally, painfully, come to a resolution. It’s like they are actually trying to make my head explode. So I’m grateful for the few menu items that don’t appeal to me. I usually never order any kind of steak (unless I’m at a steakhouse), I can typically nix anything that involves olives or foie gras (still not a favorite), and I always glaze my eyes over the chicken offerings. It doesn’t even come close to being a contender. In my mind, chicken is something I eat at home when I’m feeling a lack of creativity in the kitchen. I’ll dredge a tired little flab of breast meat in flour, pan fry it until golden on both sides, and then simmer it in some sort of wine-saturated broth. It’s fine, occasionally very pleasant, but never exciting. Never something that I would feel inclined to serve to dinner guests. So I was surprised when, at a recent media dinner at Chef Kerry Simon’s new restaurant LA Market at the JW Marriott in Downtown LA, the humble chicken dish was the menu item that completely stole the dinner show. To my right was a steaming plate of glossy braised short ribs, collapsing into a potato puree. To my left, an inch-thick grilled rib-eye, serenaded with a gorgonzola polenta. In front of me, seared cod with delicate pebbles of black lentils. There’d been gnocchi with jumbo lump crab and truffle parmesan cream too, a sultry local burrata with grilled farm bread, and a tuna dynamite appetizer with lump crab, tuna, sushi rice, and red chili aioli. LA Market’s new Executive Chef Nona Sivley, the winner of this past season of “Hell’s Kitchen,” was dining us to the nines. No stomach at our table in the middle of the spacious lobby restaurant would be left wanting at the end of the two hour meal. Yet even after the luxurious burrata and the truffle-scented knuckles of gnocchi, all I could think about – all I wanted to eat – was the darn Brick Organic Chicken with organic farro, braised beet greens and citrus jus. I was in awe of the taut, crisp skin, stretching across the surface of the brined chicken like a spandex sweater. The chicken itself is equally impressive – delicately scented with lemon and so tender it makes me wonder if Texas-native Nona is running a chicken massage parlor at the back of the kitchen. The accompaniments are no less enthralling. The earthy farro is enlivened with sweet grapes and crunchy marcona almonds – the perfect wholesome counterpoint to the rustically prepared chicken. Even as plates of food – a sushi pizza, a slab of country toast oozing with sautéed mushrooms – continued to wiz by me, I could barely lift my eyes to notice them. All I wanted was the chicken. LA Market’s astutely prepared poultry dish presents a problem for my future restaurant excursions. No longer can I dismiss chicken from the menu as the boring or bland choice. LA Market has made chicken a contender again. May the good Lord be with the next server who waits on me. Growing up I associated sweet potatoes with one thing -- marshmallows. I only ever consumed them on Thanksgiving, and even then I would usually just eat the marshmallows off the top and then move on to the more familiar territory of my mom's mashed potatoes. Some time around high school, however, it dawned on me that sweet potatoes are actually far more flavorful and nutritious than an ordinary russet. Incidentally, it was also around this time that I started to become more conscious of my waistline and the foods I was putting into my body. For a 16-year-old, not being able to fit into a pair of skin-tight jeans can be the difference between popularity or social pariahdom. Unless one is a complete dork like me and it doesn't matter if you can fit into a pair of jeans because you still carry a massive backpack with a color-coded notebook for every subject. So, even though nobody was sweet on me (I spent senior prom night at home with my parents), during my "socially-challenged" years I became sweet on sweet potatoes. Today, I love experimenting with the Vitamin-A-rich spud and am always looking for new recipes and dishes that showcase its natural sweet and creamy texture. I was particularly excited when I heard about a sweet potato sandwich that Simple Things Sandwich & Pie Shop is offering at its Los Angeles cafe. While I haven't had a chance to get over to the cozy West Third Street shop to try the sandwich in the bread and potato flesh, I decided to try my hand at creating my own version of it for the 2011 Sweet n' Healthy Blogger Recipe Contest sponsored by the North Carolina Sweet Potato Commission. The vegetarian sandwich I came up with is a hot mess of complimentary flavors and textures. There's crunch from the slices of tart pink lady apple, a sweet tang from the caramelized onions that are finished with Sherry vinegar, a savory bite from the arugula and melted goat cheese, a salty kick from the pretzel roll, and, of course, the gorgeously candy-like flesh of the cumin-dusted sweet potatoes to bring it all together. What's perhaps most noteworthy about the sandwich is that the fiber-heavy potatoes are surprisingly super-satisfying -- a major downfall for most vegetarian sandwiches. It's a substantial meal unlike that sad marshmallow-topped side dish I picked a part as a child. There's no need to pick anything a part here. It's all good. And, most importantly, it's all good for you. 1/4 teaspoon sea salt + a pinch more for the "onion jam"
Whisk 1 tablespoon of the olive oil with the cumin, paprika and salt. Dump potato rings onto a baking sheet and drizzle the cumin-oil mixture over them. Toss to coat on all sides and then spread the potatoes into a single layer. Roast in the oven, flipping once half-way through, until tender and easily pierced with a fork -- approximately 30-35 minutes. While potatoes are roasting, heat a large nonstick pan over medium-high heat. Once hot, add the remaining teaspoon of olive oil and tilt the pan so it spreads across the entire surface. Add the red onion, stir to coat the slices with the oil, and then reduce the heat to medium-low. Let cook slowly, stirring occasionally for 10 minutes. Sprinkle with a pinch of salt, then continue cooking over moderate-low heat for another 20 minutes. Just prior to serving, stir in the two teaspoons of Sherry vinegar so it forms into a bit of a jam. To assemble the sandwiches, spread a thin layer of goat cheese over each side of the two toasted pretzel rolls (the heat from the rolls will help melt the cheese). Top each bottom with three-four slices of sweet potato (it's fine to layer them a little). Finish with apple slices, onion jam and the arugula. Serve and enjoy immediately. And it had to be chocolate. When selecting my last post-lunch dessert prior to Lent, See’s Scotchmallow Bar seemed an obvious choice. While I was somewhat dismayed that the 190-calorie-bar only comes in milk chocolate – not the dark chocolate that is reserved for the confectioner’s smaller Scotchmallow pieces – I still felt it would be a worthy indulgence. The one-and-a-half-inch wide, four-inch long bar is a behemoth compared to my usual post-lunch dessert – a couple sections of a dark chocolate bar. Plus, with the weighty milk chocolate layer, it was sure to induce a state of sugar overload, which is exactly what I was hoping my second-to-last-dessert-dance would do. In my mind, the best way to prepare myself for another 46-day dessert hiatus was by overdosing on something so sweet and so chocolaty that I wouldn’t be able to even look at a piece of chocolate the next day without feeling nauseated. I was priming the pump, so to speak. Priming the pump for deprivation. Or, perhaps more accurately, gorging before a long dark period of hibernation. As I suspected, See’s Scotchmallow Bar was the perfect choice for the gorge. It’s almost toxically sweet with its thick robe of milk chocolate and hearty interior layers of fluffy marshmallow and buttery caramel. I was ready to stop half-way through, but pushed on – cognizant that the next day I would be drinking green tea for “dessert.” My head and stomach ached by the time I took my last bite. “How does this only have 190 calories?” I thought. Suspicious nutrition information aside, See’s Scotchmallow Bar is the perfect way to prepare for a 46-day abstinence from dessert. But for everyday indulgences, I think I’ll stick to the dark chocolate Scotchmallow pieces in the future… approximately 38 days from now. “Tony will finish it.” I think as I stare down at my heaping container of garam masala chicken meatballs with coconut madras curry, crispy fried onions, tomato chutney, cilantro chutney, and saffron basmati rice from the Great Balls on Tires food truck. I grimace at the amount of food that I’ve just ordered – food that I don't need at 4 pm on a Sunday afternoon when I’d eaten lunch just two hours prior. A big lunch. I’d practically inhaled my quinoa salad with tofu, mixed greens, radishes, and fennel, and then nearly swallowed the apple I’d selected for “dessert” whole. So as I’d been sitting in my favorite local wine shop, DomaineLA, sipping the wines selected for that Sunday’s tasting event with Great Balls on Tires and feeling malnourished from my sad salad, I couldn’t stop thinking about them. Especially after a fellow taster started raving about the meaty food truck’s Indian-inspired Ballywood Ball ($6), one of the more inventive offerings on the menu created by Chef Michael David, who was formerly the Executive Chet at Comme Ca Restaurant. As her eyes sparkled with signs of sublime satisfaction, I’d decided that I couldn’t continue my casual sipping until I’d tried it also. “I’ll just take a bite,” I’d told myself as I walked up to the truck to place my order. “No harm in that,” I’d justified. Even now, just moments after being presented with the weighty portion that includes two massive meatballs, a tuft of fluffy rice, and the chutneys and crispy onions, I’m still convinced that I won’t eat it all. I’m still convinced that I’ll just “take a bite” and then pass the rest along to my friends. “Tony will definitely eat this,” I reason once again, as I slide my fork into the supple flesh of the garam masala-spiced chicken meatball, impressed by the meltingly tender interior. The flavors explode in my mouth – crushing my tongue with heat, fragrant spices and sweet intermingling tones that soften the blast from the curry and accompanying chutneys. I gasp in surprise. My fork is moving faster now – scooping up the delicate saffron basmati rice, siphoning off bite after bite of the oversized meatballs, and dancing in the chutneys that both brighten and punctuate the dish. Because suddenly I don’t want him to want any. I don’t want him to finish it. It’s the best thing I’ve ever tasted from a food truck, and today I want to take all the bites. For 27 years I’ve been fighting it. In my mind, a picky eater is someone who won’t eat anything – who cringes at the sight of an egg, makes her mother strain out the onions from a sauce, will only eat meat that is charred black, and will spend an entire weekend at a camp away from home eating saltine crackers and energy bars because she doesn’t want to eat the food being served there. I picture these images because that’s how I was for the first twenty years of my life – before I discovered how much I actually like to eat. Since becoming more open-minded about the (edible) items I put in my mouth, I find myself increasingly bothered by the self-description that appears under the title of my blog. Does a “picky-palated princess” eat blood sausage, sweetbreads, tongue, raw oysters, foie gras, chicken liver, pork neck, octopus, and kangaroo? A “picky-palated princess” eats white meat chicken, well-done salmon and salads with the dressing on the side. Yet as much as I’ve grown from the days when I gagged at the sight of a mushroom and reprimanded my poor mother if so much as a flake of cheese was touching my chicken parmesan (she baked my breasts separately, sans mozzarella), I am still kind of a picky eater. 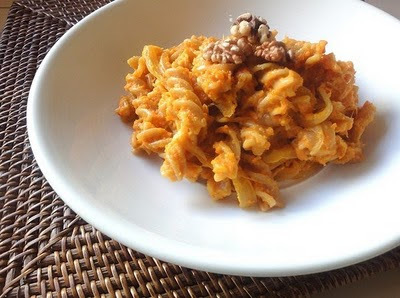 Given my preferences and notions about what constitutes “proper eating,” I was a little horrified when I realized that I needed to make this whole wheat pasta with carrot mascarpone sauce, a recipe I developed for the “Eating Rainbow” series on TasteSpotting, for lunch on Saturday. “I can’t possibly eat pasta for lunch,” I thought. I never eat pasta for lunch. I’ve always considered pasta way too heavy for a mid-day meal – like the type of thing that would immediately throw me into a food coma and completely undermine my ability to accomplish even the simplest of tasks the rest of the afternoon. I’m stunned when I see other people ordering pasta at lunch, appalled by their brazen disregard for the rules of eating nature. Despite my stance that pasta should never be eaten before 6 pm (I’m calling it my “antipasti” for lunch rule), on this particular occasion I was more horrified by the thought of taking pictures of the aforementioned dish at night. So I made the pasta, took all the requisite photographs, and then, at approximately 2 pm on Saturday, I sat down at the table and ate every single bite. The pasta was far better than I expected – sweet, savory, and sporting a texture that almost rivals macaroni and cheese. I loved the way the carrot mascarpone sauce wedged itself into the spirals of the rotini noodles, and couldn’t get over how well the toasted walnuts complimented the flavors. I ate the same thing I ate for lunch for dinner. Even more startling, nothing bad happened as a result of my "impropriety." Because with this pasta, there’s no room for rules. It’s appropriate for any time of day – with or without a glass of wine to pair with it. No one would ever describe me as a "light eater." I've been called a "healthy eater." Some have even referred to me as "a hangry." But no one, not even my mother who is supposed to tell me exactly what I want to hear, has ever said, "That Diana Takes a Bite – what a light eater! Never ever clears her plate." Because if they did, it would be a bit fat lie. While almost everything I prepare for myself is healthy, I tend to eat larger than average portions of whatever it is I'm making. I roast up half a head of cauliflower and whip up some quinoa to go with my chana masala, I braise an entire bunch of kale when making braised greens with chickpeas, and it's not uncommon for me to eat half a bag of baby carrots for a "side" at lunch. I get embarrassed about the size and girth of my home-cooked meals, fretting about the day when I'll actually have someone else to eat with and then I'll go and scare him off when I come to the table carrying a trough of food. I don't even need to close my eyes to imagine his horrified, eye-bulging reaction as I sit there next to him hungrily diving into a mountain of veggies, quinoa and tofu that could rival Mt. Kilimanjaro. Not exactly a precursor to a romantic evening. So I was a little anxious going to Chef John Rivera Sedlar's new modern Latin, tapas-style restaurant, Playa Rivera, this past Tuesday night. I'd heard a few rumors that the portions at Sedlar's second restaurant, located in the old Grace space on Beverly Blvd., were more mole hills than the mountains I'm used to eating. Considering the price point (small plates range between $7-16, large plates between $19-27), I wasn't too keen on the idea of leaving with an empty stomach. But I was anxious to try the restaurant and anxious to catch up with my friend Kate, so was not inclined to dismiss mid-city's latest dining hot spot because I was worried I might actually be able to zip up my jeans after. Upon arriving in the chicly styled space that is artfully groomed with exposed white-painted brick, orange leather chairs and chandeliers that almost seem to be composed of Hawaiian grass skirts, I felt a glimmer of excitement about the evening before me. Regardless of whether I left fully satiated, I knew that I was going to have a fun evening. I bellied up to the impressively stocked bar manned by beloved cocktailian Julian Cox and ordered a glass of sparkling Rosé to enjoy before sitting down for dinner. Because my friend had already been to the restaurant for the soft opening a few weeks prior, it was easy to narrow down the menu of maize cakes, "warm" and "cool" small plates, sides, and "individuales" (larger plates). To start, we opted for the Papas Salsa Verde, kennebec potato chips artistically layered with a bright salsa of avocado, chiles, serranos and micro cilantro ($7); and the Tortillas Florales with organic flower petals and Indian butter ($8) that were made famous at Sedlar's first restaurant, Rivera. While the chips and tortillas are categorized as "cool" plates, both emerged from the kitchen freshly fried and warm. The former is the sophisticate’s version of tortilla chips and guacamole – a refined interpretation that lives up to the restaurant's mission to create "spirited combinations composed with modern artistry" and "tapas-sized plates of beautiful, delicious food." With their delicate pressed edible flowers, the tortillas are similarly inspired – we quickly devoured the four maize cakes with accompanying avocado butter. We are presented with the Flor de Calabaza Tempura, squash blossom stuffed with Spanish bacalao and luxuriously strewn with chorizo jus, capers and castelveltrano olives ($11) next. The salty cod is an unexpectedly delightful stuffing for the lightly battered blossoms, and the capers and olives add an additional punch of briny flavor that feels apropos rather than overkill. The two corn arepas stuffed with grilled shrimp, feta, cilantro, and mango are less exciting in comparison, but still present nice flavors – they are just displayed in a more traditional package than many of the other items on the menu. For our last two bites, we opted for two more small plates – the Arroz con Pato, duck confit with baby vegetable pickles, arroz blanco jus, fresno chiles, chives, micro cilantro ($16); and the Tamalli Chipotle, a wild-mushroom duxelles dumpling with filet mignon and chipotle béarnaise ($13). While the duck confit is a knock-out with its taut, crisp skin and luxuriously meaty interior, we both craved more of the fragrant arroz that's layered underneath it. As it is, the rice is more of a garnish than an accompaniment. The flavors are apparent, but it's impossible to get a true forkful. By the time we'd reached the last forkfuls of tamale, both of us were comfortably full and more than satisfied by the variety of tastes and flavors we’d experienced. While there was no need to unbutton my jeans, I didn’t feel wanting in any way because every bite I took felt purposeful. I imagine that a few of my fellow hearty eaters might still find issue with portion size, but for a tapas-style restaurant that is striving to do more than just entertain guests with a trough of food, they feel just right. I loved being able to try so many different dishes, and loved how the constant influx of plates kept with the pace of the lively space. I won’t feel any hesitation when returning for more of Sedlar’s eclectic and artful dishes. When the flavors are this accomplished, there’s no need to bury them in a mountain. I’ve always felt a little sad for See’s Dark Nougat chocolate. It – as well as many of the other delightful See’s confections like the Peanut Nougat, the Chelsea, and the Milk and Dark Patties – are so often overshadowed by the cult favorite Scotchmallow. It’s always the first chocolate that anyone mentions when I bring up See’s. “Oh I loooove the Scotchmallow!” They exclaim, usually with a twinkle in their eye that tells me the item has some sentimental value, as well. It’s hard to not love the bulbous See’s dark chocolate-covered confection with its sweet ribbon of buttery caramel layered beneath a fluffy mass of honey marshmallow. When I buy custom boxes of the chocolates for myself (I maintain a well-stocked stash of chocolate), I always include at least three of the delightful candies. But I also include three of the Dark Nougat, seemingly the dark horse amongst the rows of neatly stacked chocolates in each See’s Candies shop. I love the chewiness of the honey nougat, the crunchy pieces of roasted almonds, and the delicate slivers of coconut hidden throughout. It’s not as cloying as many of the other chocolates – the dark chocolate lends the treat just the right amount of bitterness and the almonds help temper the sweetness of the honey nougat. So when I stumbled into the pop-up See’s shop at the Grove one night a couple weeks ago, I was thrilled to see that even though they don’t have the glorious counter filled with chocolates, they do carry the Awesome Nut and Chew Bars, the bar version of the Dark Nougat . I’d been wanting to try the confection for some time. While the solidly packed, inch-long piece is plenty satisfying on its own accord, I was intrigued by the notion of eating a three-inch version. Logic would seem to suggest that if one inch is amazing, three inches would be even more amazing. While the glossy bar obviously tasted very similar to the individual chocolates I’m so fond of, the ratio of almonds to nougat to chocolate was not quite to my particular fancy. It’s a great candy bar, but it’s approximately half the height of the actual Dark Nougat pieces – likely because it lacks girth from the sizable hunks of almonds. By the time I’d reached the tail end of the 200 calorie bar, I was experiencing sugar overload. The higher proportions of chocolate and nougat were too sweet without the almonds to temper them. That said, I wouldn’t be all that disinclined to purchase a Nut & Chew Bar again. Especially after I get through these next 45 days of a dessert-free Lent. All throughout college, I considered French toast the ideal order for brunch. It was more exciting than pancakes, more filling than waffles courtesy of the decadent egg batter, and, perhaps most importantly, it satisfied my lust for carbs and more carbs. This was, of course, in between our in depth discussions of the new spring lines at Banana Republic and J. Crew. Since graduating and moving to Los Angeles, however, my lust for French toast has slowly eroded. While I’ve discovered amazing versions at the Griddle Cafe, Square One and Canelé, recently I’ve completely nixed the sugary offering from my brunch vocabulary. Today, it seems it’s all about the incredible edible egg for me. I was curious. As was my eldest brother who, like me, has a raging sweet tooth and penchant for carbohydrates. When our waitress came by our table to take our order we decided to split a plate along with our egg dishes. It was the only sensible thing to do. I imagined that I would take a couple bites of the thick slices of French bread dipped in vanilla and cinnamon egg batter, topped with bananas, strawberries, mascarpone cheese, and toasted almonds, and be done with it. I had an egg panino to attend to that was housing more than enough carbs to keep my blood sugar levels humming for the rest of the day. Yet when the plate arrived, neither my brother nor I could keep our forks away from the fluffy slices of cinnamon-scented toast. While I was expecting the dish to be over-the-top rich, the indulgent coating of mascarpone cheese wasn’t overly aggressive on the palate. It worked harmoniously with the sweet bread and fruit, somewhat mitigating the sweetness that is normally associated with French toast – likely because there was no need for syrup. It was completely addicting, and it completely overshadowed my humble, yet tasty, incredible edible egg panino ($9.95). And then I’ll send her a link to the new dress I like at Anthropologie. All morning long I read the tweets as I readied myself for brunch with my family down in Orange County. It seemed that everyone and anyone who had any interest in food and dining in Los Angeles was going to LA Weekly Pulitzer-Prize Food Writer Jonathan Gold’s Gold Standard event at the Peterson Automotive Museum at Fairfax Ave. and Wilshire Blvd. that afternoon. I was secretly jealous and wishing them all massive stomach aches (not really), but didn’t blame them for their excitement. With 40 of Jonathan “the Belly of LA” Gold’s favorite restaurants serving up signature dishes like Jitlada’s famed crying tiger beef and Starry Kitchen’s cult favorite crispy tofu balls, it was destined to be one of the finest LA-based food festivals of the year. Especially with unlimited pours from 30 different wineries, frothy mugs brimming with Singha beer, and other specialty cocktails like Old Fashioned’s from Cole’s Downtown. Even with all the love I feel toward the people who show their affection through harassment and stickers, when Cathy from Gastronomy Blog called at 12:45 pm to ask if I could possibly use her ticket for the event, I didn’t hesitate. Yes, I’d just consumed half an order of French toast and half an order of an egg and cheese panino (a few short hours after an early breakfast of yogurt and banana), but that was no matter. The Belly of LA was calling and I needed to answer. I hastily bid my family goodbye – hoping they’d understand it was my stomach, not them that was driving me toward the exit – and immediately began the trek back up to Los Angeles. It felt strange arriving at the at-capacity food festival already full – especially when so many of my contemporaries had made extensive preparations for the event. Per their tweets, they’d arrived starving, in stretchy pants, with clear-cut itineraries for how they would take down the expansive array of offerings from acclaimed restaurants like Providence, Mozza and Cut, as well as non-restaurants like Ludo Bites and Manila Machine. I felt more than a little lost as I made my way into the tented area armed with my wine glass and a fistful of plastic forks. Where did I begin? Was I even ready to begin? I secured a pour of Chardonnay from Justin Winery and then made the prescient decision of heading directly to the Ludo Bites booth where Ludo’s wife Krissy Lefebvre was graciously doling out cups of his criminally buttery whipped brie with honey balsamic gazpacho and frisée. I somehow finagled one of the last four servings of the delightfully indulgent offering and took a moment to savor the velvety texture of the sultry brie before casting my sails toward the rapidly depleting pastures of food. Because I was already feeling taxed from brunch, I was careful about my selections. Though I imagined that Eva’s 48-hour Bolognese, Bludsoe’s pulled pork and brisket, and Slaw Dog’s “death dog” would be prime feasting for those who hadn’t already consumed two meals that day, I needed to tread lightly. Little Dom’s popular smoked oyster (all oysters were shucked on-site to maintain optimal freshness), A-Frame’s sweet and spicy Furikake Kettle Corn, and Ramen Jinya’s Tonkotsu ramen were most attractive to me given my current state. My sweet tooth raging after the teasing taste of A-Frame’s popcorn, I was ecstatic to discover that Bistro LQ was serving up mini sesame and green tea macarons. Both Christina from Food je t'aime and I agreed that they were the perfect texture – slightly crispy around the edges, and delicately chewy in the center. As I finished my macarons, I sheepishly asked a man standing near the display if he worked for the restaurant. I flashed bright red when someone informed me that he was Chef Laurent Quenioux. To chase my macarons, I secured another bite-sized treat from Providence’s table across the way. Despite its small size, the compressed pineapple and curry petit four packed an assertive display of sweet, tropical flavor. Of course, the most assertive flavor award undoubtedly goes to the crying tiger beef and green curry with chicken and vegetables from Jitlada Thai. The fragrant spices and searing heat blasted my metabolism into high gear. Despite the heartiness of the plate, my palate felt cleansed by the intensity of the spice. While arriving at this year’s Gold Standard already satiated was seemingly the worst possible scenario, in a way I was actually able to enjoy the event more than I would have if I’d arrived with a one-track-mind to eat everything in sight as quickly as possible. The real reason that I high-tailed it up from Orange County in 56 minutes time was not because I was dying to stuff my self silly (I do that on a regular basis already). I wanted to be there because I wanted to see all my friends and colleagues. What they don’t tell you in the press releases is that festivals like these aren’t really about the food – they’re about connecting with like-minded individuals and the talented chefs that have turned LA into what Jonathan Gold considers “the best place in the world to eat now.” On this particular day, I had the opportunity to embarrass myself in front of Chef Laurent Quenioux, receive the sincerest of hugs from Jitlada’s owner Jazz, chat with Krissy Lefebvre about all the exciting things in store for her and Chef Ludo, spend an afternoon with my fanatical food friends, and, most noteworthy of all, meet the Belly of LA. That’s the stuff that makes the Gold Standard so special. The food itself is just the cherry on top. Softer Soles $25 Pedicure Giveaway Winner!